Firmware upgrade to support NDSI 1.43(for products 1.41,1.42, 3DS). 3. Increase maximum number of support skins from 8 to 64. 4. Redefine 12 new defaults skins. 5. Unique skin customize features. Through the user interface, user can easily modify skin. 6. Support UTF-8 decoding for usrcheat.dat file. 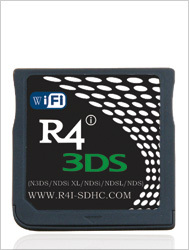 r4i sdhc red 3ds languages 1.44b NEWEST!